A very early, heavy-cropping variety. The pure white flesh is quite soft and waxy and delicious with mint and a knob of butter! New, boil, steam or saute. First Early. 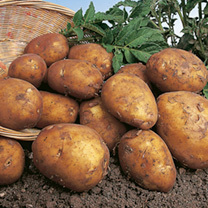 Unlike the other reviewer, we found these potatoes virtually free of slugs etc. They cropped well and were delicious, which is why we've ordered more! Bought for 2014 growing season. Yields were very high and taste was good after harvesting a few plants. Didn't get to enjoy potatoes as many were eaten by slugs or infested with wireworms. Will not be ordering this again.